This year was a pretty huge year for gaming – it’s not every year that two next-generation gaming machines hit store shelves, and few console launch’s have been as heated or as controversial as the debate among gamers about the merits or flaws of the PlayStation 4 and the Xbox One. But even though much of the news centered around Microsoft’s and Sony’s clash of the titans, this year’s best games aren’t to be found on the newest pieces of hardware. No, this year I found the best gaming experiences to be the small, short, and often thought provoking independent game titles that I could pick up for $15 or less and play in an afternoon. Below are my top five video games of the year, with number one being my Game of the Year. Fighting games have a certain affliction which seems to plague them year after year – lack of single player content. The most recent example of this is the Xbox One launch title Killer Instinct, which features absolutely no arcade or story elements. To me, a primarily single player gamer who still enjoys the skill and complexity of a good fighter, this is a problem. Thankfully Netherrealm Studios, the makers behind the excellent 2009 Mortal Kombat, know how I feel. 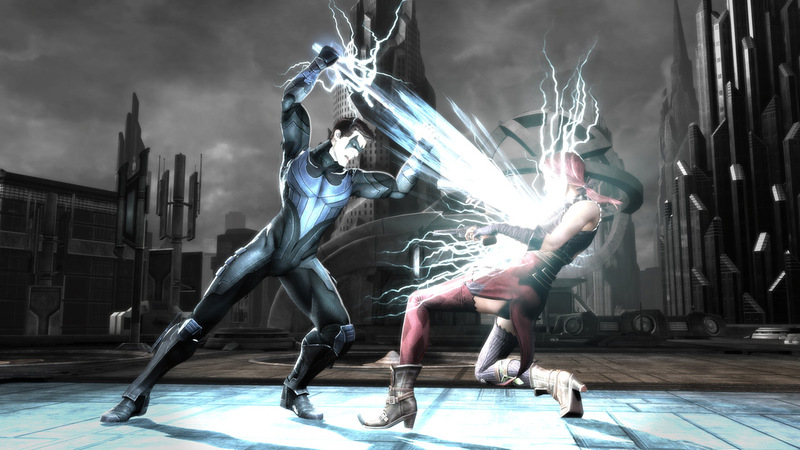 When I learned they would be making a fight based in the DC Comics universe, my expectations as both a comic and fighting game fan were sky high. What Netherrealm delivered was Injustice: Gods Among Us, a visually stunning fighter filled to the brim with content, both online and off. While most fighters provide bare bone single player experiences or none at all, Netherrealm delivered a full length story mode, complete with voice acting, cinematics, mini-games, and what I would call the best alternate DC universe storyline in the history of DC Comics. Coupled with the S.T.A.R. Lab challenge missions, tons of unlockables and plenty of online matchmaking options and Injustice is not only the best fighting game of the year but one of my favorite games of last year as well. Assassin’s Creed III let me down. It really didn’t fulfill any of it’s promises. The controls were sloppy and unresponsive. The main character Connor showed no emotion or complexity. The storyline, with it’s constant shoehorning of Connor into practically every pivitol event of the American Revolution, is boring at best and cringe worthy at worst. If this was the future of the Assassin’s Creed franchise, I wanted no part of it. But among all the crap was one shining beacon of hope, the naval missions. 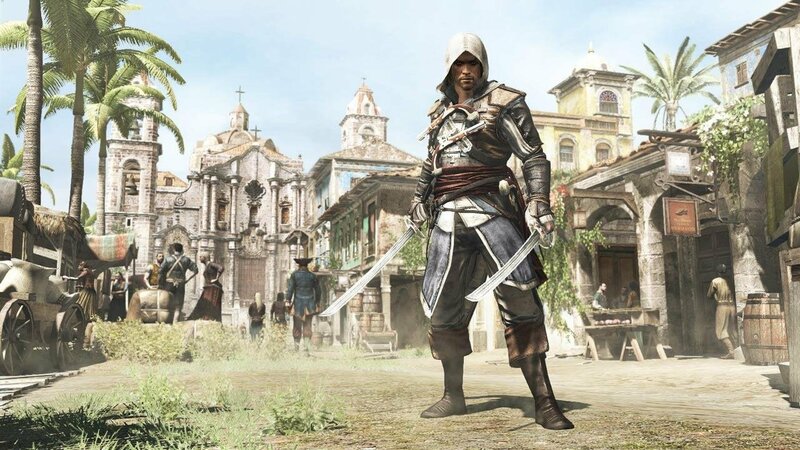 Soon rumors began to surface that an Assassin’s Creed pirate game was in the works, drawing heavily from the naval combat of III and expanding it and perfecting it. I told myself I would come back to the franchise if the rumors were true. The rumors were true, and I came back to the franchise with arms wide open. I don’t regret it. Black Flag is an improvement on III in just about every regard, with more precise controls, beautiful visuals and a more captivating historical background. I feel a little guilty including this on my top game list. Black Flag’s narrative isn’t very impressive. It is sometimes confusing, and for the most part doesn’t accomplish much or move the storyline of the franchise any further. What is does do however is provide the ultimate escape from reality. It is so easy to get lost in this digital version of the Caribbean, exploring every nook and cranny. Who hasn’t dreamed of sailing the high seas, free as can be, with your crew of pirates and friends, doing what you want when you want? Now after nearly 100 percenting Black Flag, I can safely say it is not only the best and most polished Assassin’s Creed game, but also the best pirate game in gaming history. 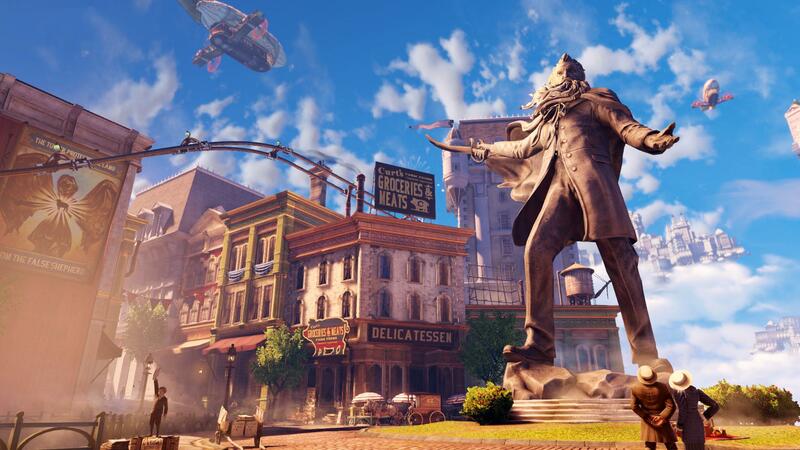 A long time in the making, Bioshock Infinite let some with too high of expectations down. Some criticized it’s violence or it’s linearity. Others compared it to it’s predecessor, saying the floating city of Columbia wasn’t as interesting or as well done as the sunken dystopia of Rapture. I beg to differ. The themes of race, American exceptionalism, and religion found in Infinite I found to be much more captivating and thought provoking than the economics of Rapture. Throw in the sci-fi element of alternate realities and the idea that one choice, one single act, can change the course of one’s life entirely and you have me hooked. The gunplay is just entertaining icing on the cake. Infinite is on this list, despite it’s flaws, because it made me feel uncomfortable. Entering a temple dedicated to Abraham Lincoln’s assassin, John Wilkes Booth, made me uncomfortable. Being asked to lynch an interracial couple made me uncomfortable. The level of violence Booker directs towards his enemies, violence he can’t seem to control, makes me uncomfortable. If something in a game makes me uncomfortable, it is probably doing something right, and Bioshock Infinite hit just enough right notes to make it one of my top games of 2013. There is no combat in Gone Home. No mini-games. Almost no voice-acting. It takes only about two or three hours to finish. Which is exactly why Gone Home is so brilliant. Players occupy the body of a young twenty-something girl coming home from an extended trip across Europe. While she was away overseas, her family moved into a strange new house, and when you arrive nobody is home. Cryptic messages tell you not to snoop around, and to definitely not go up to the attic. What follows is a simple game of exploration, finding documents, notes, and other clues that help the player piece together what has happened to this family, in particular your younger sister Sam, who is the author of many of the notes lying around the house. 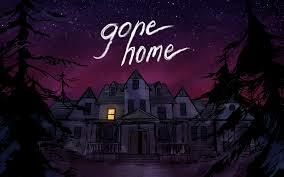 I loved Gone Home because I wasn’t sure what to expect. I finished it in one single, intense and focused sitting as I searched every inch of this spooky and foreign empty house. The game throws curveballs at you, at times making you think it is something it isn’t. At the end, the very real and very strong feeling of dread I had before opening the door to the attic was something I haven’t felt in a video game in a long time. 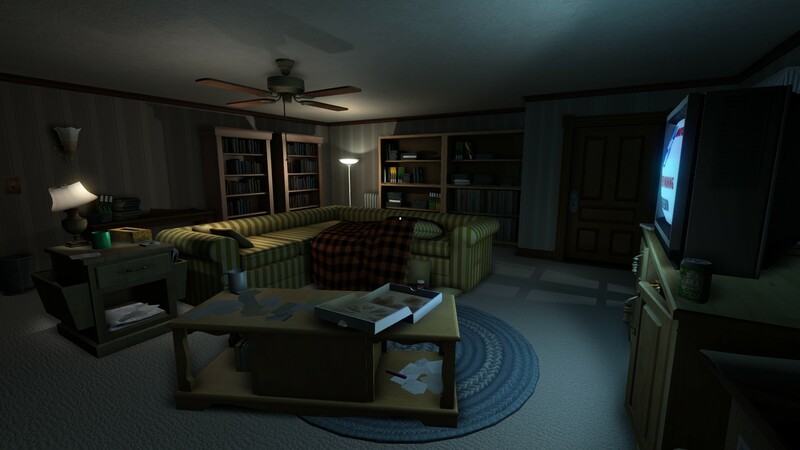 Gone Home is important because it shows games don’t have to be about guns or violence. They don’t have to last 30 hours to be considered “worth it.” And they don’t have to be told in cinematics that take you out of the experience, but rather can be told simply through the gameplay. For all the reasons above, Gone Home is one of my favorite games of 2013. 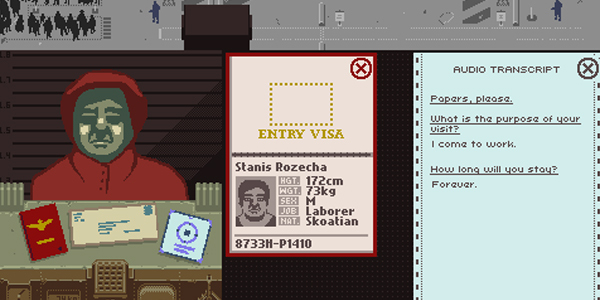 Papers, Please is an indie game about stamping passports. And reading rule books. And verifying birthday’s and expiration dates. Sound exciting? Not really, but place these mundane sounding game mechanics in a dystopian country called Arstotzka, reminiscent of Cold War Soviet Russia, where you work as an immigration official on the border and things get complicated quick. With one simple “Access Granted” or “Access Denied” stamp can save or ruin somebody’s life. Do you deny this man entry because his paper’s aren’t up to date, even though it would separate him from his wife and child? If you let him through your job might be on the line, as every mistake you make cuts into your already measly paycheck, which you must use to pay for food, heat, and medicine for your family. Do you accept bribes? Do you detain innocent people because you get money for every three people detained? Do you help rebels trying to smuggle agents into the country? Every chapter of Papers, Please includes more heart wrenching choices like these than any other game I’ve played. The consequences of your actions are near immediate and painful. For more than half of the game I wasn’t able to provide both heat and food for my family. Soon all of them were sick, and I was forced to allow my uncle to die so I could have enough income to buy medicine for my wife, son, and mother-in-law. All of this is told in in the retro aesthetic of the game were people for the most part are just pixelated silhouettes and 90 percent of your time in the game is spent at a desk staring over documents. 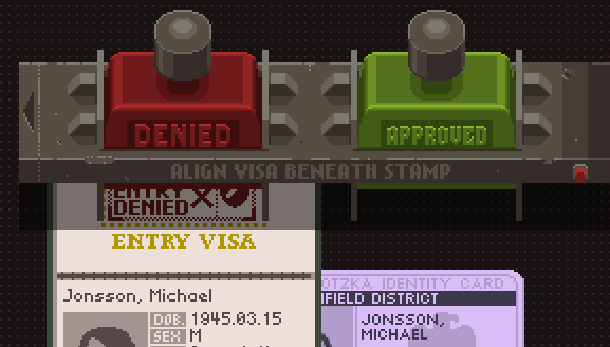 This simple gameplay and clean interface, combined with it’s social commentary on security checkpoints, full body scanners, privacy and immigration law, makes Papers, Please without question my game of the year. Check it out. Glory to Arstotzka. What games were among your favorites this year?